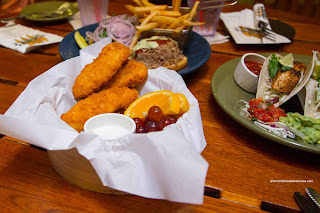 With an evening flight to Honolulu that would include a 3-hour time change, our dinner schedule was in disarray. Sure, we could've purchased food on board the Air Canada jet, but that didn't really interest us. 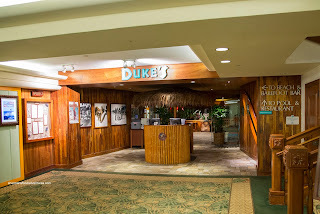 So we got some eats prior to boarding and planned to hit up Duke's in the Outrigger Hotel once we arrived. 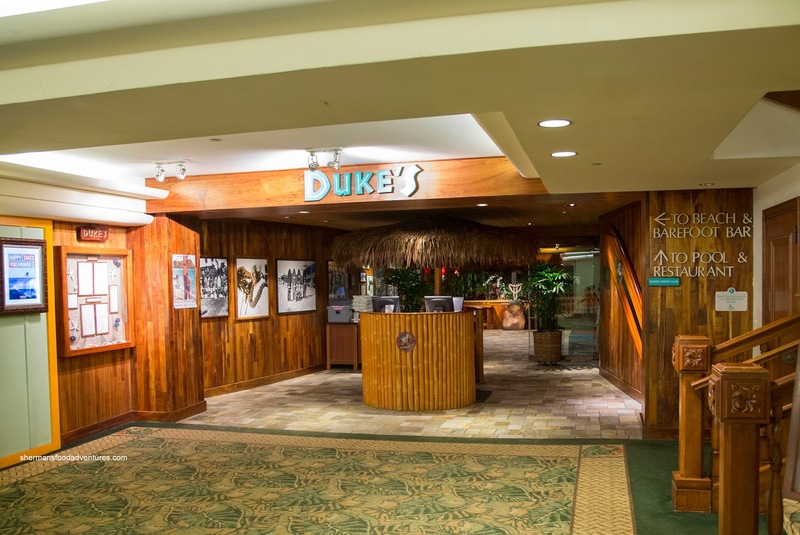 We had visited Duke's the last time we were in Honolulu and we wanted to reminisce (when we didn't have any kids and life was so carefree!). Making the short walk from the Aston Waikiki Circle Hotel, we decided to head to the Barefoot Bar side of the Duke's because we were hungry but not that hungry. 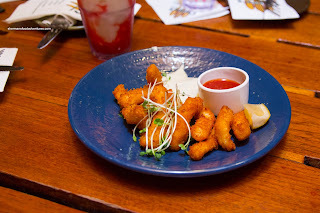 Things began with an order of their Calamari coated with crispy panko, lemon caper aioli and tropical cocktail sauce. As much as the dish didn't look that impressive, the squid was money. Each piece was buttery and tender while still maintaining a chew. As mentioned, the coating was perfect being firmly crispy while not greasy. For me, I thought the aioli was a better match for the calamari as it was creamy with a tart finish. My son wasn't too lively at this point and merely chose the kid's Chicken Strips with some fruit (not for him, but for my daughter). These were also prepared nicely with tender and moist breast meat coated with a crispy batter. Again, it wasn't greasy and it was seasoned enough to stand on its own without the ranch dip. 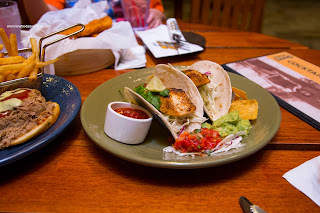 Viv and I shared 2 items including the Cajun Fish Tacos with flour tortillas, tomatillo sauce, guacamole, pico de gallo and fresh chips. Although a bit too done for our liking, the fish was seasoned well as it was savoury and a bit spicy. We thought the gauc and salsa were a bit weak. The best item of the meal was the Kulua Pork Sandwich with BBQ & tomatillo sauces, watercress, tomato and red onions on Hawaiian sweet bread. The massive mound of pork was super tender and buttery moist. The combination of sauces added a good balance of sweetness and slight spiciness. Although it started to fall apart, the soft sweet bun was a nice match for the pork. 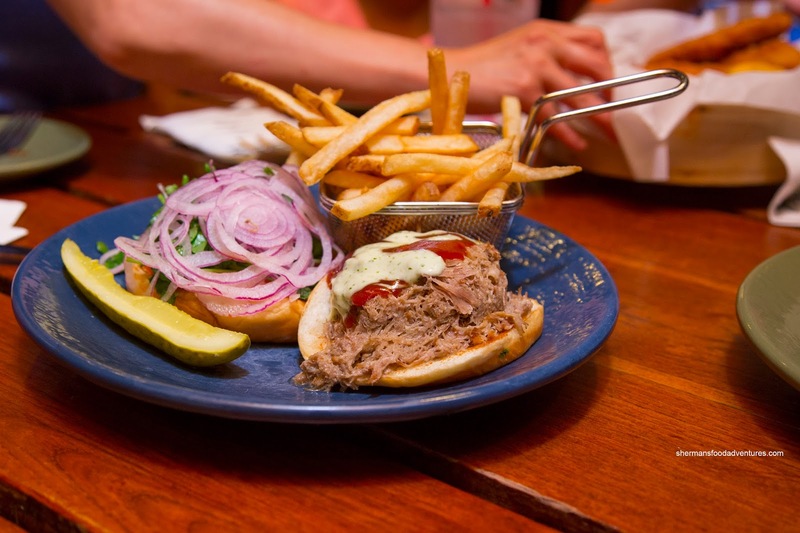 Even though we only sampled 4 dishes, it was pretty evident they know what they are doing at Duke's. I've been twice in the past and yes it's been awhile, but I've never had a bad experience.